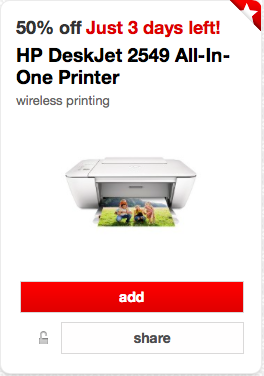 Target has a high value 50% off Cartwheel offer on the HP DeskJet 2549 All-In-One Printer. This printer normally retails for $79.99, so you can pick it up for $39.99. I own an HP printer and my favorite thing has been signing up and using HP Instant Ink. HP Instant Ink is a monthly ink subscription plan from HP. Your printer is equipped with the technology to order new ink when you’re running low. HP ships new ink directly to you before you ever run out. The best part is, you don’t pay for individual ink cartridges and you don’t have to run to the store for ink anymore! Plans start as low as $2.99/month and are based on pages printed, not cartridges used. There is no annual fee and you can change or cancel plans online at any time. Plus, you can print in color or black and white and the fees are the same. I love it! Not all printers are compatible with Instant Ink so you will have to check to see if this computer works with the program.